Nicely Done Sites has been using and recommending Kingston brand flash memory for as long as we have been in business. When it came time to finally get our own custom USB drives made, we had a hard time finding a company that used high quality memory. Thankfully, we stumbled upon Kingston's offer in a Facebook ad they were running. The ordering process was perfect, I was able to add my own custom graphic and even see what it looked like on the model flash drive I selected. The order was placed, and before I knew it they were here at my office, ready to go! I would highly recommend this service to friends and colleagues, and I look forward to my next order with Kingston. I’ve been a fan of Kingston products for a long time. The whole layout, ordering and fulfillment process went perfect. I was intending on purchasing just plain USBs, then saw the option to add a logo and thought “why not”. I was concerned that adding a logo would add to the fulfillment time, but it did not. I had my drives within a week, with standard ground shipping. I will not hesitate to order more if the need arises. 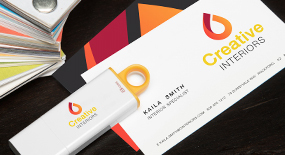 I was very pleased with my recent purchase of customized USB's for my specialized photography business. 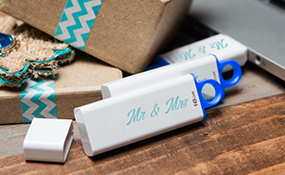 My customers not only receive the digital files of their photo session, but the customized USB provides them with my business contact information for additional services. 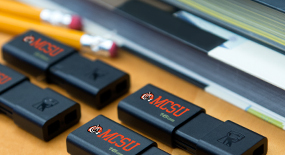 The easy-to-use design software for customized USB's, was easy to use and allowed me to quickly evaluate many different print sizes and colors before choosing my customized format. I would highly recommend Kingston for their efficiency and speed in meeting my small business needs. I was impressed by how easy they were to order and how fast they came and they looked perfect. I just copied files on two of the DTIG4/16GB drives I ordered for a client. I like the fact that they have my business name on them. Hopefully my customers will like them and it is a great way to spread my business name around. They "look great", and I found your website process for creating and purchasing them to be "ideal." And, your prices are good. So, if the drives sell on a trial basis, Elkhorn Slough Safari will be buying more. I saw the Kingston custom USB drives through a facebook advertisement. I was in the market for new flash drives since alot of my older ones are low on storage and arent very eye appealing. I am a growing small business who is trying to improve my brand and the recognition of my logo. Seeing that I could put my company logo on a Kingston flash drive directly appealed to me. The ordering process was efficient and user friendly. There were alot of customization and storage options. The product arrived in a timely manner and looks amazing. I am very pleased.